I’ve had this instrument for about 6+ months; this is what I think about it now. 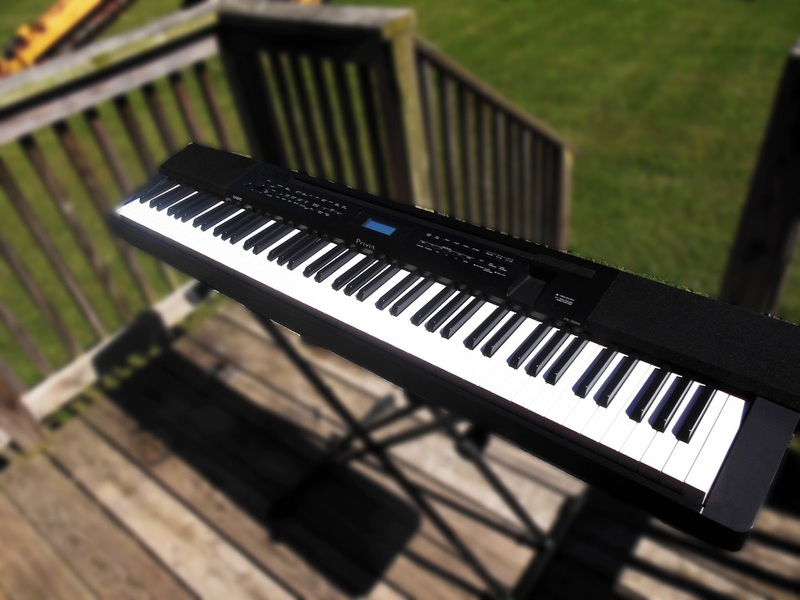 The Casio Privia PX-350 is Casio’s newest entry into the portable digital piano line (It is the newer versions of the PX-330.). It is more feature rich than then the PX-150 but less than the brand new PX5. 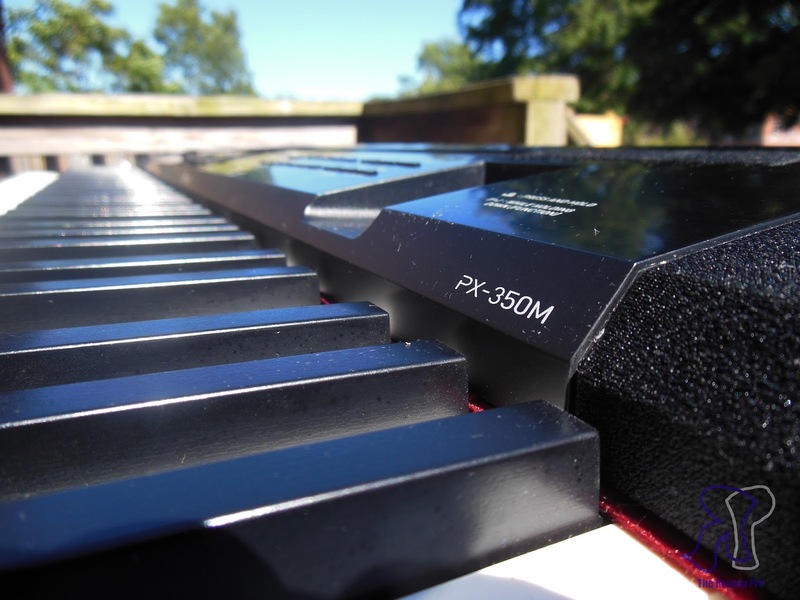 The Casio PX-350 relies on both the Tri-Sensor Scaled Hammer Keyboard and the AiR which means acoustic & intelligent resonator. These to features combined produce an unprecedented sound and feel that wasn’t seen before in a keyboard that can be purchased less than 1k. All of the piano sounds are great, but some of the other 250 tones are hit or miss. The beauty of having Midi or USB Midi is you get pretty much unlimited amount of tones. As stated earlier the on-board speakers sound great as long as you stay under the max volume (the highest I go is about ¾ the way) then you lose a bit of dynamics and in some cases may experience speaker popping. Audio recorded to an USB Flash drive sounds amazing. It will produce a Wav file, but I noticed that the volume is tad on the low side so I suggest normalizing it using an Audio application such as Audacity. Audio through a PA or amps sound great as well. There are so many features on this digital piano that makes it way more valuable than it is priced. 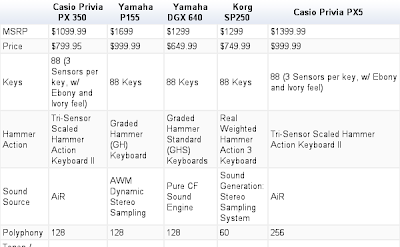 This is a spec sheet comparing the PX350 to other in its class. To vice full specs got HERE!!! There are many digital pianos less than 1K but not many are as feature packed as the Casio Privia PX-350. Are there ones with more features? Yes, but in end they are seriously lacking in other areas. You are getting the real deal when you purchase this instrument. The Sound it produces is very dynamic and expressive, that is rare to find in digital pianos less than 1k. 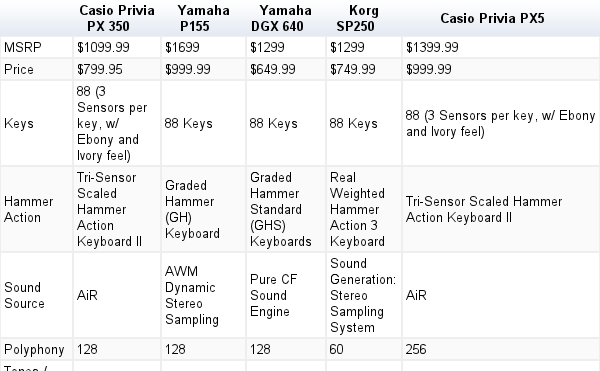 The synthetic Ebony and Ivory feel is unheard of in digital pianos under $2500. Normally Casio is playing catch up in the digital piano game but as of late they have been a step ahead of the game and raising the bar enough to make it competitors nervous. I’m Curious to see how Yamaha will answer to this. Their last Digital piano in this class was the Yamaha P155 which is still a beast in its own right but it is starting to look a bit dated.